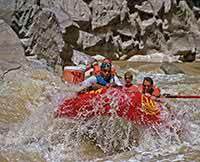 My boyfriend and I went on a 4 day multi-sport Westwater Canyon river trip over July 4th 2010. From the start of booking our trip, we received outstanding service from Western River Expeditions. On the second day we went out on a Hummer ride seeing wonderful scenery. The driver was awesome and knowledgeable of the area. what a wonderful 4 hrs. Then, came the white water rafting on the next day. We were picked up at the lodge and greeted by the guides. I was nervous about rafting as I never experienced rafting previously. Our guides were VERY knowledgeable and set my fears away as they explained everything, prior to entering the water. At the end of the day, I had the BEST time, and I am making plans to return for a longer trip of white water rafting. The scenery is breathtaking, and guides all are friendly, knowledgeable, and experienced. WE had a great time.